Most people venturing into the wild for the first time want the reassurance that comes with having more than one person in the tent at night, and that’s completely understandable. Veteran backpackers however, experienced in the ways of the woods and in search of the type of peaceful solitude that can only be found there, often opt for solo tents. Solo tents are typically marvels of efficiency; engineered to fit easily in your backpack and light enough to be carried for days without wearing you out. They also setup fast and do just as good a job protecting you from the elements as any full size camping tent. Below we’re going to take a look at the 10 best solo tents on the market as selected by our product review experts. The ALPS Mountaineering Lynx is a free-standing solo tent that sets up fast and features plenty of ventilation, a roomy vestibule you can use for additional storage, a superb rain fly that will allow you to stay dry as toast, a waterproof floor with factory sealed seams and a gear loft for your clothes, smartphone, reading material or anything else you want to put there. The Lynx weighs in at less than 4 pounds and yet is large enough at 90 inches long to accommodate just about anyone. Zippers on the door and vestibule are high-quality, anti-stick affairs that provide reliable, smooth performance time and again. Easy setup in about 5 minutes. Sits low to minimize wind exposure. Features a roomy vestibule that can be used for additional storage. Large D-shaped door for easy entry and exit. Uses durable 7075 aluminum stakes that won’t succumb to conditions. It’s not really a cold weather solo tent. Not a lot of headroom inside. The ALPS Mountaineering Zephyr solo tent sports an innovative design that’s extremely stable while at the same time providing something many solo tents don’t: headroom. Yes, you’ll be able to sit up and have a snack (just don’t do that in bear country), read a book or just take stock of your day. There’s plenty of ventilation, a roomy gear loft, factory sealed fly and floor and a large vestibule for taking off your boots before you enter, or to use for storage. Once you raise this solo tent you’ll see how the designers have managed to carve so much head room out of such a small amount of fabric. And the whole thing weighs only 3 lbs 14 ounces to boot. Definite candidate for best one man tent. At 86 inches it’s long enough for everybody. 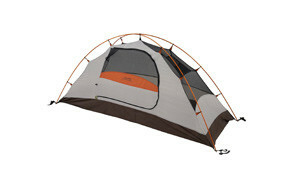 Lots of ventilation make this a great warm weather solo tent. Rugged 7075 aluminum poles won’t buckle in the wind. 3 feet of vertical loft in the center. Includes guy ropes and tent bag. Could be tricky to setup without practice. Higher profile means more wind exposure. 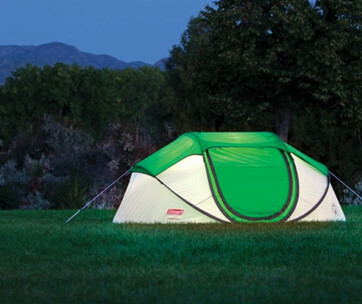 The Eureka Midori Solo is another basic solo tent that hits all the right beats. It sets up easy, has plenty of room inside for even the largest backpacker and their gear, has a spacious vestibule and uses two shock-corded 7000 series aluminum poles that crisscross for optimal stability. The floor features factory sealed seams to keep the moisture out and there’s tons of no-see-um mesh for excellent flow through ventilation. The door is large and opens easily, the gear loft is large and strong and the shell is made of durable, fire retardant nylon. If what you want is a tough, no nonsense easy to assemble solo tent at an affordable price, here it is. Lightweight and packs down small. Fly is color coded for easy installation. Side entryway with large vestibule. Decent headroom for a solo tent. Vestibule and tent doors open in opposing directions. Interior pockets seem like an afterthought. The Luxe Tempo Single Tent tries hard to set itself apart from the competition and the good news is that it mostly succeeds. Unlike some other solo tents you can actually consider taking this on your winter camping sojourn as it’s extremely stable, features a high density nylon shell and has a full sized waterproof fly that will keep the cold north wind at bay. The doors consist of 2 layers of material, the aforementioned nylon and a layer of mesh. And there’s nearly 40 inches of headroom at the center so you can get dressed inside; which is crucial on frigid days. It’s easy to setup, tough and affordable. What else do you want in a solo tent? Rain fly is 20D Ripstop nylon. 3000mm PU coating on the floor. Very stable even in high winds. Mesh doors unzip only from the inside. Total weight of 4 pounds including ground sheet. Takes a bit longer to setup than some other solo tents. Takes up some room in your backpack. The Kelty Gunnison solo tent provides a lot more space under the fly than many other solo tents, including a full coverage vestibule that can be transformed into an awning in good weather via your trekking poles. The KG solo tent is not the lightest one person tent on the market but what you get is a solo tent that has a full tent feel to it. Setup is straightforward though it may take a bit of practice and there’s plenty of no-see-um mesh to provide air circulation. There’s 40 inches of headroom at the center so you can sit up inside without crouching and the large D door features high quality, stick resistant zippers. Ground sheet included. Easy to use shock-corded aluminum poles. Factory sealed fly and floor. Durable ground sheet for extra moisture protection. Lots of mesh provides flow through ventilation. Limited lifetime warranty on materials and workmanship. A bit heavier than other solo tents. A single storage pocket on the inside. 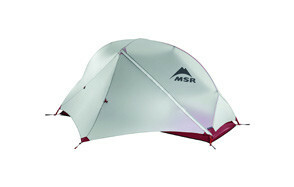 The MSR Hubba NX Solo Tent has a ‘space age’ look some will love and others won’t love as much. Looks aside however it has a slew of things going for it including its remarkable light weight (2 lb 7 oz), the 30D ripstop nylon factory-sealed floor, the silicone-coated waterproof rain fly and the fact that it packs down to almost nothing, thereby saving room in your backpack. There’s a 9 square foot vestibule and 3 feet of vertical space at the center so you can sit up without hitting your head. The aforementioned 30D floor has sacrificed ruggedness for light weight so be sure to use a ground sheet. Other than that it’s all good. Single pole design is remarkably stable. Maybe the lightest solo tent on the market. Spacious vestibule for storing gear. Doesn’t come with a ground sheet. Will cost more than most other solo tents. Archer has outdone themselves with this solo tent. Its light weight is due to a number of factors including the 190T polyester shell, the slim but tough aluminum poles and the waterproof but somewhat thin factory sealed floor. At about 3 ½ pounds it’s not quite as light as the Hubba reviewed above but it’s still light enough to go practically unnoticed when it’s in your backpack. Like other ultralight tents this one is not going to provide enough cover in the dead of winter but it’s a great solo tent for spring, summer and fall. Affordable as all get out too. Lightweight tent design for easy carrying. Large vestibule area keeps the weather out. Central hook for your camping light. Packs down to 18 ½ by 6 ½ inches. Lots of headroom at the center. Too light for winter camping. Lots of headroom means greater exposure to wind. The Flytop Single Person Solo Tent isn’t going to bowl anyone over with its design but it should impress more than a few people with how easy it sets up and how stable it is in challenging weather conditions. This is a narrow tent but one that manages nonetheless to squeeze out 40 inches of headroom. It’s fairly light, very affordable and uses 210T polyester in the floor that’s factory coated with 3000mm of PU waterproofing. Ventilation is good if not great and there’s a large mesh pocket inside to hold your valuables while you sleep. 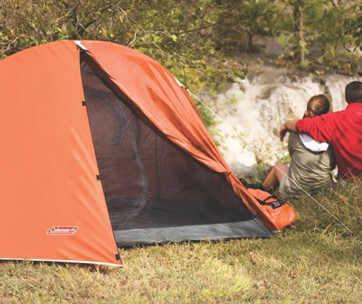 This solo tent is long enough at 82 inches to accommodate most and it doesn’t eat up space in your pack. Ultralight tent design with easy setup. Waterproof floor keeps moisture outside. Durable aircraft grade aluminum poles. Rain fly provides excellent coverage. Won’t win any beauty contests. TETON Sports can be relied upon to produce all types of high quality outdoor gear and this Mountain Ultra Tent is another feather in their cap. You’re going to pay more for this than for many other solo tents but what you’ll get in return is rock solid build quality, a weather resistant low profile and lightweight durability. There’s plenty of micro-mesh ‘windows’ to foster good ventilation, a waterproof bathtub floor to keep the water outside where it belongs and an innovative design that utilizes a single pole; which cuts down on setup time and carry weight. That carry weight checks in at just under 4 pounds which makes it an ideal solo tent for long treks. Extra high waterproof bathtub floor. 1 shock corded aluminum pole reduces setup time and weight. Copious mesh for optimal ventilation. Rain fly clips in place and stays there. Limited lifetime warranty on workmanship. It’s going to cost you more. Make sure you order the solo tent as there are 4 sizes. The final tent on our review list is the Geertop 1 person Bivy Solo Tent which is actually a pretty remarkable piece of equipment given its price. The Geertop boasts a full size fly that provides total coverage during rain events, factory sealed seams to provide even more protection against encroaching moisture and a pair of opposable mesh windows that ensure flow-through ventilation. The solo tent is long at 84 inches and there is 3 feet of headroom at the high end. It uses 7000 series aluminum poles that are lightweight and rugged and it weighs a measly 3 ¼ pounds so you can take it anywhere. A great 3 season solo tent value. All seams are double stitched. Oversized rain fly ensures you stay dry in all conditions. 2 doors allow more setup options. Plenty of interior storage for your valuables. Breaks down to 17 x 4 x 4 inches. Windows may be too large to be practical. Camo option seems a bit much. Before purchasing your solo tent you’ll want to know a few things about how they’re made and how they work. Q: What Is A Vestibule? A: Lots of people are thrown off by the term “vestibule”. It seems to imply something very solid and formidable but what it really refers to is a small patch of protected ground that’s created by the fly extending out beyond the footprint of the tent near the door. The vestibule is commonly used as a place to remove wet, dirty boots and sometimes wet clothes before entering the solo tent, though not all vestibules are large enough to do that. Most everyone uses this covered area to store things that won’t fit in the tent. This is particularly true when talking about small, narrow solo tents like the ones reviewed above. There are 2 kinds of vestibules: front and side. Front vestibules extend from the front door of the tent. These are most common on round or square tents. Because they’re associated with multi-person tents the front vestibule tends to be pretty large. Some can be large enough to accommodate a camping chair. Side vestibules are what you typically get on solo tents, simply because there is nowhere else to put them. They’re not a spacious as front vestibules but they’re still big enough to allow easy access to the door while also providing room to store some gear you don’t want inside. Q: What Is A Rain Fly? A: The rain fly is what prevents you from having to break camp and go home if it starts to rain. 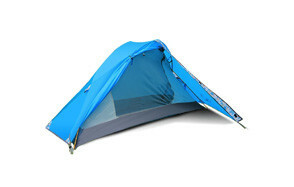 It fits over your solo tent providing protection from rain, snow and wind. You will be hard pressed to find a waterproof tent for one person so a quality rain fly is essential. There are two types of rain fly; partial coverage and full coverage. Within the category of partial rain flys there are those that nearly fit over the entire tent and those that only cover enough to keep rain from coming directly in through the mesh windows. A true full-size rain fly by comparison will cover every part of the solo tent and make sure there is no area that is coming in direct contact with precipitation. The ability of a good rain fly to also mitigate the effects of strong wind cannot be overstated. Strong wind can ruin your camping experience just as easily as rain or snow so being able to deflect it is a huge plus. A freestanding solo tent is one that’s kept upright by poles that are part of the internal structure of the tent. All of the tents reviewed above are freestanding tents. With freestanding tents the poles tend to be covered by the rain fly and are largely invisible from the outside when the fly is in place. As a general rule freestanding tents are a bit heavier than non-freestanding tents due to the poles. Freestanding tents are also prized because they often don’t need to be staked down and they setup and break down quickly. 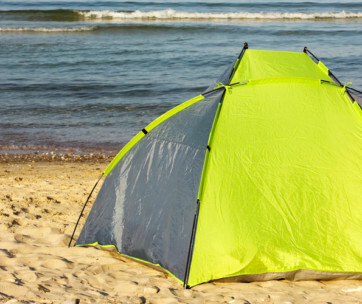 Non-freestanding solo tents are sometimes indistinguishable from freestanding tents because they also use poles to stay upright. In this case however they use trekking poles which means if you normally bring trekking poles with you you’ll save on weight because you won’t need special tent poles like with a freestanding solo tent. Non-freestanding tents must be staked down, they typically feature single wall structure with no rain fly and if you damage a trekking pole it’s easy to replace. The overwhelming majority of solo tents however, are freestanding tents. Q: How Long Will A Solo Tent Last? A: This is not a question with a single, straightforward answer simply because solo tents come in all shapes and sizes are made from different materials and are used for different purposes. That said, any high quality tent regardless of size should last you many years if properly cared for. The exception being tents used by climbers assaulting the world’s most extreme peaks. Let’s take a closer look at the things that impact the lifespan of your tent. There’s just no substitute for a well-made tent. All the nifty design cues and flashy colors in the world won’t allow a poorly built tent to withstand wind, snow and rain for very long. Premium solo tents on the other hand are engineered to last and feature tough, tear resistant fabrics, rock solid stitching in all the seams, high quality no-stick zippers, poles made of high quality aluminum and true waterproof floors. As with most things in life you’ll pay more to get more. While quality materials and solid construction are the bedrock elements for determining how long your solo tent will last it’s also important that your tent be designed for the type of use you have in mind. For instance if you repeatedly use your 3 season tent in the winter time you’ll not only be frequently uncomfortable, you’ll also drastically shorten the life of the tent. If you purchase a solo tent with a partial fly and then use it often in rainy conditions you’ll again shorten its lifespan and make yourself miserable in the process. While few people think about things like tent maintenance it’s one of those simple things that can make all the difference when it comes to extending the life of your solo tent. Cleaning it regularly, folding it properly and storing it according to the directions will ensure you get the most from your single person tent. Here are a few other ways to make your solo tent last a bit longer. Always use a ground sheet (sometimes called a “footprint”). Always use the rain fly even if it’s not raining. Clean your one man tent after every outing. Make sure you dry it thoroughly after cleaning and before storing it. Make repairs when it becomes necessary. Don’t let damage linger. Store your hiking tent out of direct sunlight. Some people will make their solo tent last 30 years while with others the same tent won’t last 10. What separates the 2 is usually nothing more than making sure you’re not asking too much of the solo tent and developing good maintenance habits. If you are the type that likes to venture out into the wild by yourself you know the value of a good solo tent. These marvels of modern engineering are light years ahead of similar tents made just 20 years ago and can provide you with a stable, dry, warm environment so that you can emerge in the morning refreshed and ready to face another day on the trail. We hope you found this information on the best solo tents helpful and that it allows you to make an informed decision when purchasing your next lightweight one person tent. Don’t forget to stop back often for more insightful product review guides from Gear Hungry.